Total protection for your boat's vinyl, canvas, and fabric surfaces! The Marine 31 Vinyl & Fabric Care Complete Kit gives your boat the ultimate in protection for its vinyl and fabric surfaces. Sea air and sunlight lay siege to your boat's soft-touch surfaces including vinyl, canvas, and fabrics. If left unprotected bimini tops, sail covers, boat covers, vinyl seat cushions and other synthetic surfaces will quickly age and degrade. In order to maximize protection you must have a clean surface. 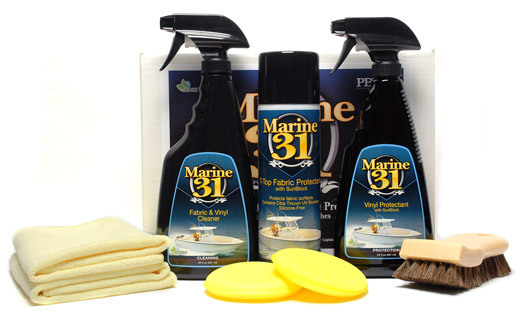 That is why the Marine 31 Vinyl & Fabric Care Complete Kit includes the excellent Marine31 Fabric & Vinyl to cleanse and prepare all vinyl and canvas surfaces. In order to increase the cleaning power in a gentle manner, a Natural Horse Hair Brush is included. Once cleaned, coat fabric and canvas with several coats of Marine 31 T-Top Fabric Protectant with SunBlock or vinyl surfaces with Marine 31 Vinyl Protectant with SunBlock for the ultimate in protection. Use Marine 31 Fabric & Vinyl Cleaner on all vinyl, carpet, canvas, and upholstery surfaces in the inside and on the outside of your boat. Keeping these surfaces clean is the first step in prolonging their life and increasing the joy you get from piloting your ship through the bays. For maximum protection, follow cleaning with a light coat of Marine 31 Vinyl Protectant with SunBlock on vinyl surfaces or Marine 31 T-Top Fabric Protectant with SunBlock on canvas and fabrics. Marine 31 T-Top Fabric Protectant is an advanced aerosol formulation designed to prolong the life of your boat's tower top (T-Top). Marine 31 T-Top Fabric Protectant is formulated with Ciba Tinuvin UV Inhibitors. These are the most advanced ultra-violet light blockers in the world. Give your boat's T-Top the protection it needs to last in the tough nautical environment with Marine 31 T-Top Fabric Protectant. Marine 31 T-Top Fabric Protectant will not dry out canvas or fabric, nor will it attract additional dirt and dust. Marine 31 T-Top Fabric Protectant is an aerosol protectant that gently penetrates into the canvas or fabric to provide exceptional, long-lasting protection against moisture, staining, and sunlight. Seal your T-Top with Marine 31 T-Top Fabric Protectant. A Word from the Captain's Chair: In order to get the best protection possible it is important to clean your fabric, vinyl or canvas first. Clean the surfaces with Marine 31 Fabric & Vinyl Cleaner. The apply the appropriate Marine 31 protectant. Look great while you sail the seas! Anchors up! A total retail value of $91.92. You save $21.93!